I've dreamed of making homemade Larabars for a long time. Yet I put it off, and put it off, till this week I read about foods that are excellent sources of digestive enzymes. That inspired me to dive in! It just so happens that 2 of the key ingredients in Larabars — dates and nuts — fit into the “excellent sources of digestive enzymes” category! However, dry nuts are rich in enzymes only if soaked and then dehydrated at a low temperature. Nourishing Traditions calls these nuts “crispy nuts”. 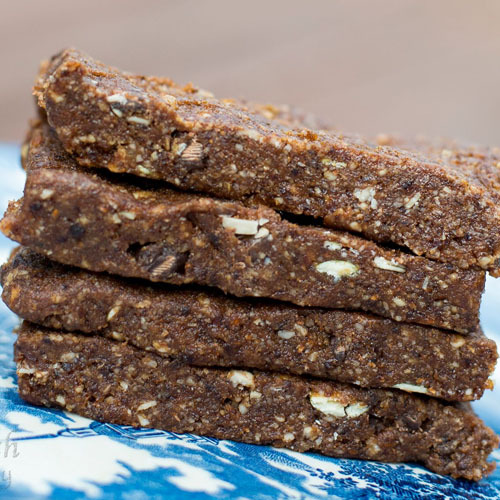 If the original Larabars have unsoaked nuts, my homemade bars are not only less expensive, but also much more nutritious. They are rich in digestive enzymes instead of enzyme inhibitors. Choose organic ingredients whenever possible. Choose unsulphured dried fruits dehydrated at low temperatures (115 degrees Fahrenheit or less). If you use figs for the “other” dried fruit, you'll have chosen another enzyme-rich dried fruit! Also, pick dates that haven't been coated in oat flour. Choose raw nuts for making your crispy nuts. 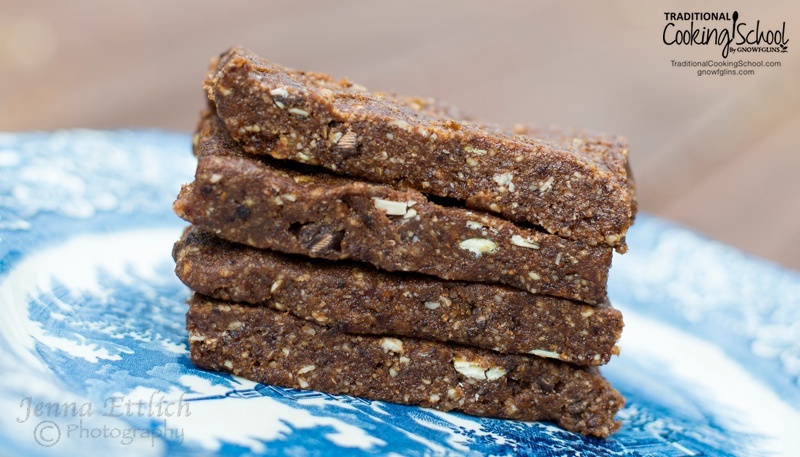 I use soaked and dehydrated nuts in these homemade Larabars, making them a digestive enzyme-rich food! Adapted from this recipe. 1/3 cup add-ins such as unsweetened shredded coconut, soaked and dehydrated seeds, chocolate shavings, these no-sugar, stevia-sweetened chocolate chips, etc. Process dates, dried fruit, cocoa powder and sea salt in food processor until all chopped up. It will be like a thick paste, and perhaps even roll up into a ball. Remove from food processor to a bowl. Put nuts (and seeds or coconut, if using) in the food processor. Process until a coarse meal. Break up the fruit paste into chunks and add back to the food processor. Add chocolate shavings or chips (if using). Process to incorporate all ingredients. It may roll up into a ball. Press with your finger – does it hold together? If not, add additional water, tablespoon by tablespoon to achieve this. Press the dough into a stainless steel 8-inch square cake pan. Refrigerate for 15 to 30 minutes until hardened sufficiently for easy cutting. Bring out of refrigerator and cut into bars. I do 18 bars — 6 rows of 3 bars each. Each bar is 1 inch by 2 inches. Store the pan of bars in the refrigerator, covered tightly so they don’t dry out. Or wrap each bar individually and store in the refrigerator for an easy grab-and-go snack! Enjoy! How do you make your homemade Larabars? Do you have a favorite flavor? This post was featured in 49 Nourishing No-Bake Cookies and Bars, 25 Natural Gifts For The New Mom On Mother's Day, and 39 Nourishing Postpartum Freezer Meals To Prepare While You’re Pregnant. i’ve been wanting to make something like this for a while, yum! i’m pretty sure that the Lara bars are not made w/soaked and dehydrated nuts because when i buy foods that ARE made that way the packaging usually says so, as in the case of > Lydias Organics grain free and raw “granola” or > Better Than Roasted’s nut butters. also lara brand isnt organic. all the better reason to make your own! .-= emily´s last blog post… Real Food at the Grocery Store: hand-rolled butter, sheep’s milk yogurt, real kraut and kimchi =-. Thanks for this recipe, Wardee! Larabars are one of my favorites, but they can get expensive and our grocery store doesn’t stock them reliably. This will also be useful beginning for me to try some flavor experimentation. .-= Deb´s last blog post… The Story of Cap and Trade =-. Angela – I agree! We sometimes grab them when we’re out and buying 5 of them – one for each of us – really adds up! Deb – I hope your friend can make good use of this! It is fun to try variations, too. Everyone – I forgot to add how to package these, so I’ll go back and edit the recipe. The bars can be kept, covered, in the same pan in the refrigerator. Or you can wrap them up individually so they’re ready to grab and go (that’s what we’ve been doing). You might also try prunes. Traders Joe’s has 2 cup bags of sulfite-free prunes. .-= gilliebean´s last blog post… THE SOCIAL NETWORK =-. What kind of dates do you use? I haven’t eaten many dates and Azure has 4 or 5 varieties. .-= Millie´s last blog post… Persimmon Bounty =-. Millie – I’ve had honey, medjool, and halawi dates. I almost tried barhi once. They (Hummingbird Wholesale) said those dates are sweet and soft. My favorite dates are medjool, but they are most expensive usually. I also love the halawi dates. Wardee, your bars look really good! I’m like Millie and have never had a Larabar. I must live a sheltered life, lol because I’ve never heard of them and I didn’t know there were different kinds of dates either. Your blog is also the first time I heard of herbamare! LOL! I mentioned we eat simply… 😉 These bars look seriously good because I love nuts. This looks AMAZING. Thanks for sharing. Oh – one question – how long would they last? Could these be frozen to extend their life? Jessie – Definitely freeze them to extend their life. Otherwise, I’d say about a week in the fridge at a minimum – perhaps could go two weeks. yum! I’ve never had a Larabar either but they look delicious. I’m going to try these on my snack starved kids. They are getting sick of snacking on dried fruit and nuts so I’ll just repackage them haha! .-= Sustainable Eats´s last blog post… Dark Days Challenge Week #3 =-. Sorry to bother you again with another question – but to almonds really have enzymes anymore? Nearly all almonds sold in the US are pastuerized & are still labeled as “raw”. The only true “raw” almonds you can buy are sold directly by farms. Hi, Jessie! You’re right that retail almonds are pasteurized. If organic, it is done with a H20 (steam) pasteurization. In any case, you can buy directly from a farm to circumvent this. I can buy (truly raw) almonds through a natural food warehouse for $7 per pound. They are in Eugene. Where are you located? I don’t know of other sources, but I’d think some googling might net you a source for less than $10 per pound. A bit late….. but Robyn at greensmoothiegirl.com does a bulk group buy every November for truly raw almonds for $3 per pound in 100 lb boxes, or $4 per pound in 50 lb boxes, along with other raw items. A great way to stock up for the year, or “go-in” with others if you want a smaller quantity. Hope this helps you for next year! Thanks, Cheryl! That is great to know! Can you please tell me where she buys the bulk almonds? I would sure like to know. Thanks. Is there a way to make them w/out a food processor? I don’t think my blender could handle that thick of a dough. Goldnrod – I don’t think so, but I could be wrong. You have to be able to blend the fruits into a thick paste, and grind the nuts into a coarse meal. Here’s what you could try: The nuts part could be done in a coffee grinder. For the fruit, perhaps alot of pounding and smashing would do it? Then after that, you can use your fingers to mash it all together. The greensmoothiegirl says that today is the last day to order the almonds – so maybe I’ll get some folks together for an order! The price is $4 per pound for 50 pounds minimum. $1.25 per pound shipping – this goes down with larger quanitites. Jessie – That is SO awesome! What great timing. I hope you get enough people together to make the cutoff. .-= sara kay´s last blog post… Simple Woman’s Daybook =-. I did end up having to order a few more pounds than I wanted personally – but I can either freeze them or else I can possibly sell them to friends. I’m not sure exactly when the almonds will come, but you can bet I’ll be making this recipe when they come in! Sara Kay – That is awesome! Did you use the gluten-free oats or regular oats? These look exceptional! I would probably think that the store bought ones are not soaked and dehydrated. I would think it would say so on the wrapper and I’m pretty sure it doesn’t. So Bravo! I will definitely give these a go! Maybe something my son will eat. He is so finicky these days! .-= Sarah Schatz – menus for limited diets´s last blog post… Why a weekly menu planner makes a great holiday gift for someone on a limited diet =-. This is almost exactly how I have been making Larabars since I first tried them. They are very expensive where I am and being too cheep to pay for them with my whole crew I began to experiment as well! I have never put in the chocolate so I will be trying that next! .-= Robin´s last blog post… ‘Tis the Season…To Be Thankful =-. I am going to try the Enzyme-Rich Homemade Larabars. I am pre-diabetic. Great post! I just ate a Larabar and am interested in trying to make my own. I made these the other night. My mixture was pretty thick. I added some almond butter to it. They are a little on the salty side because the almond butter has salt in it. I thought how are the we going to eat this? The answer- graham crackers! My kids absolutely love them. I am going to try to make homemade crackers. The store bought are almost gone. Great Bars! Wow! These are great. I had my mother-in-law help me make these last night, and I am pretty sure when I get home today that the rest of my pan will be gone 🙂 I am really excited to try these on my long bike rides….I think they are going to be amazing!! We started making something similar this past Christmas. I looked up recipes for sugarplums (as in visions of sugarplums dancing in heads) and found they were mostly dried fruit and nuts made into a paste and rolled into balls with added spices. The method and basic recipe were almost the same (except I didn’t know to soak the nuts yet) only without the chocolate and with spices like cinnamon, cloves, etc. Also, I think ours had a small amount of honey. Some recipes said to roll in sugar so we just skipped that. They were delicious. I look forward to trying this recipe. Thanks! Thanks for this recipe Wardee! I made them today with dates, crispy almonds, crispy sunflower seeds, dried cranberries, cocoa, and chopped chocolate and they taste amazing 🙂 I love that it’s sweet and good for you. It fixes my sweets craving yet satisfies me so I’m not going back for more. We still have a lot of cereal in the house as my hubby is about addicted to it. 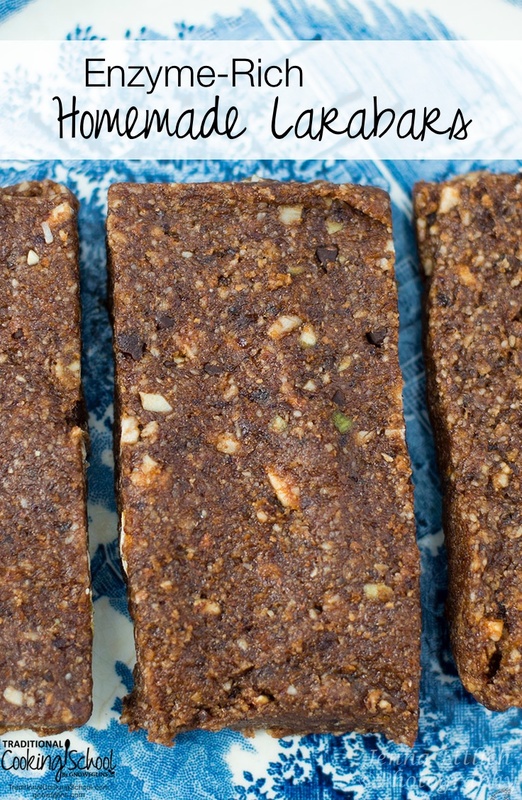 Would these be a good on-the-go breakfast bar? YUM. I like these better than Larabars! I made a dates, almonds, cherries, shredded coconut and cocoa version and a dates, apricots, apples, coconut, cinnamon version! The dates that I have are rather tough. Could I heat them in a cup of water before trying to use the food processor to process them? I was wondering if you could suggest a replacement for the dates? any ideas? thanks so much. it is a great site. Do these bars freeze well?